Those were the first word Dave Lewis said Monday, January 25th, when he returned to KMAN following a 10 year hiatus. 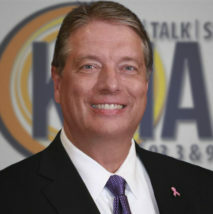 Dave serves as the station’s Program Director and morning show host. Dave has been a fixture in the Manhattan/Riley County area since 1991, when he was hired by Rich Wartell to be KMAN’s Program Director and morning show host. Dave immediately immersed himself into a number of organizations, helping wherever and whenever a need arose. In 1993, he led Manhattan Broadcasting’s efforts on informing the community during the infamous ’93 flood. He’s served on boards of directors for more than a dozen organizations, including the Manhattan Area Chamber of Commerce, Manhattan Convention and Visitors Bureau, Shepherd’s Crossing, and the Johnson Cancer Research Center at KSU. From 2002-2005, Dave was the chair of the Manhattan Riley County Sesquicentennial (150th anniversary). in 2006, The Manhattan Chamber of Commerce honored him as “Volunteer of the Year” for his efforts. He has also received numerous awards from community organizations and the Kansas Association of Broadcasters. Dave left KMAN in 2005 to become a full-time dad and business owner. He’s the owner/operator/performer with “Dave Lewis Entertainment.” He’s an accomplished Master of Ceremonies, wedding reception entertainer, disc jockey, and yes, a game show host! His booming voice is familiar to K-State fans attending games Bramlage Coliseum and at Bill Snyder Family Stadium. Since 2006, Dave has been K-State’s Public Address announcer for Football and Men’s Basketball.